Yesterday we got all suited and booted, Ebi-kun looked very smart in his little suit, we took a few pics on the road with the neighbours garden as a backdrop, she then appeared and invited us to us the garden to take some nice pictures so we did that when we got home. Ebi-kun didn't need his bag so he just put in on for the pictures. We had to walk to the school and luckily we had beautiful weather for it. When we got there we had reception, got his name badge and signed in and then a 6th grader showed Ebi-kun to his seat, he is 2nd row back so you can't actually see him here. There are 7, yes 7 classes in his grade all with 34 or 35 kids in it. The first grade here is twice the size of the whole elementary school I attended. There were loads of boring speeches, one little first grader was falling asleep and the teacher sat behind had to keep poking him to try and wake him up and catch him before he fell off the seat, watching that little incident actually kept me awake. Then we had the class photo, due to the classes being so big only one parent can get on the photo and yes, it wasn't me ! The general advice for outfits is to wear dark clothes for graduation because it is a sad occasion and something bright for opening ceremony because it is a happy occasion. In Ebi-kun's class quite a few of the moms were in cream or pastel suits but I would say on the whole it was 70% dark colors and 30% cream/pastels. I wore black because that's the way I roll. 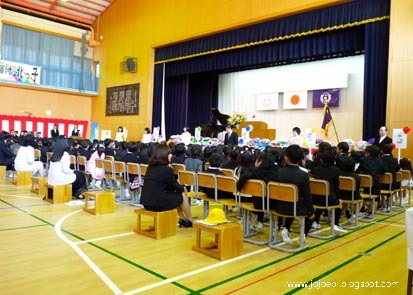 The school itself is quite modern, this year was the first time that any kids have graduated, so everything is still pretty new. 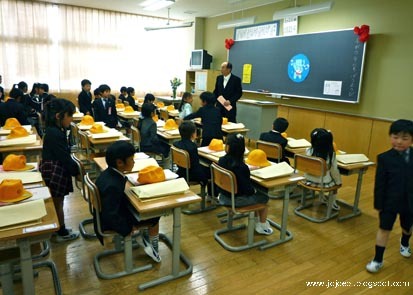 After the photos we were taken to the classroom to meet his sensei. All the rooms have these wide sliding doors which apparently they leave open most of the time. 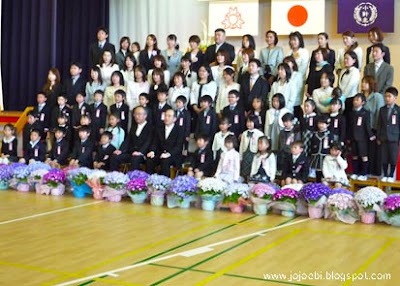 Ebi-kun is the second row back and second row in, he stands out because his hair is a lot fairer that the other kids. 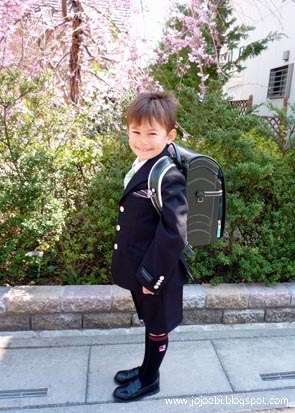 Unfortunately he is not in the same class as any of the other kids that he went to yochien with, he does know one boy in the class who lives near by, he is really naughty and so is his sister so hopefully Ebi-kun will make some new friends today. His sensei is 50 years old and also gave his full name, which surprised me, I don't ever remember a teacher telling me their age or first name, in fact it was a really big deal if you managed to find out the teachers first name when I was a kid. I am hoping that with him being one of the older teachers, he will have plenty of experience under his belt and that he isn't one of the oldies that are stuck in their old fashioned ways, only time will tell. All the kids were given a yellow hat, a bag alarm, their text books, the yellow cover for their bag and a big pile of papers. We had a quick word with sensei before we left, I know that the schools send home loads of bits of paper each day and sometimes my husband is away on business trips so we asked that during those times they mark any really important papers and the sensei offered to write them in hiragana so we should be OK.
We left around 4pm and took some more photos in the neighbours garden, even though she had gone out, she had given us permission beforehand, it still felt a bit weird. Then it was back out with the markers so we could add his grade and class to all his stuff, luckily not all 600+ things, mainly just the big items and all his bags. Daddy-ebi had a massive pile of papers to fill in and we were all done and dusted by 9.30pm. Oh yes, and the donut hanging from his bag is an alarm, we bought one because we didn't know he was going to get given one! Hello, I have been looking at your blog off and on for a while now. I think I found it doing a search for Montessori. 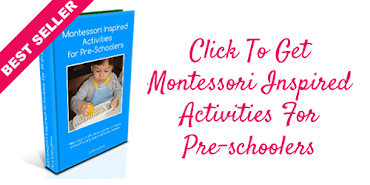 My 6 yr old son attended a Montessori preschool. I love all your craftiness and enjoy reading about your family, also I identify with being an immigrant to another country since I was born and raised in Mexico and my husband is American and we live in California. 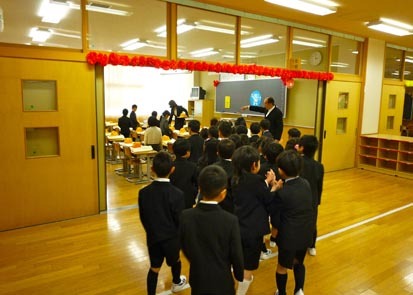 It is so interesting to me to get a little peek to school in Japan. I am looking forward to reading more about it as the year goes on. Your boy looks so adorable in that uniform. My son attends first grade at an IB charter school here in the US. 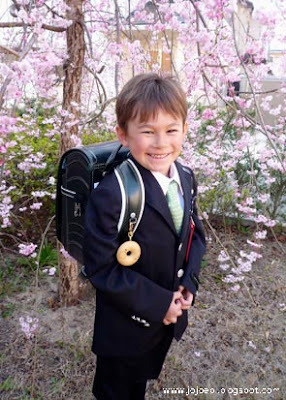 Our school year ends in June so he will be going into 2nd grade in the fall. Thank you for sharing your experience with us. The outfit he is wearing is just for the opening ceremony, he is going to a regular school so no uniform, just a yellow cap! Wow, time flys, Big BOY! it feels like he was only starting yochien last week!